Leaning into the allure of achievement, big corporations have been able to capitalize on capturing the attention of millions across the globe who aspire to one day reach the league or land atop the Billboard charts. While Nike personifies the spirit of athletes that aspire to excellence and Apple represents the ethos of innovators making the world more connected. Adidas stands for creators actively redefining industries and disrupting business models. With a growing roster of notable change-makers such as Kanye West and Pharrell Williams, the apparel company aims to represent today’s ambitious era of multi-hyphenates, reflecting an influence that extends beyond a singular segment. Julian Mitchell: Describe the inspiration behind this year’s ComplexCon activation and why this experience was important to introduce at the conference? Torben: Our biggest source of inspiration is always our consumer, and the constant feedback we receive about our brand events and experiences. We challenged ourselves to show up at ComplexCon with moments that bridge the gap between cultural icons and their fans, while offering great product through a fully digital shopping experience. In addition to our new design with Pusha T, we worked closely to give local aspiring musicians one-on-one time with him during ComplexCon. As part of the Sound Labs program, those chosen by Pusha T worked to earn a musical development grant. Mitchell: As a founding partner of ComplexCon — What was your vision when developing the concept and how have you seen it evolve to where it stands in 2018? Pharrell: The core of ComplexCon has always been about celebrating culture and connecting with people. Each year, I see ComplexCon continue to grow, bringing together more brands and consumers in more authentic ways. From the beginning, it’s always been about connecting with creators and inspiring conversations — And we’re doing just that. Mitchell: What makes ComplexCon a valuable platform for the culture and how should both brands and artists approach the experience? Pusha T: ComplexCon is valuable for the culture because the people who attend are super fans of music, lifestyle, fashion and hip hop culture overall. You get to see exactly what your demographic is into, not just musically, but in every facet of pop culture. You know what the energy is. Companies should take notice at what their consumer is into outside of just their brand and learn to merge all of them together. Mitchell: Adidas Originals has been a brand celebrated for championing the creative class — Why is this so important for the brand and what role do you see the brand playing in shaping contemporary culture? Torben: For us, we’ve always seen our role as one of a connector – championing the creative mindset. As a brand, we’ve been able to provide a platform for creative minds that they may not otherwise have access to. It’s been through these authentic connections that we’ve been invited into the conversations that are shaping culture. Mitchell: How has the brand vision and narrative around creators evolved and what impact do you hope to make going forward? Torben: As a brand, we put creativity at the center of everything we do. We’re driven by pushing ourselves to go beyond what has come before to create something that feels entirely new and innovative. By inviting others into the fold, we’re continuously expanding our creative community to empower a new generation of creators. Mitchell: Describe your storied history with Adidas and how the collaboration has evolved? Pharrell: We’ve had a long standing relationship and have been collaborating for some time now. Through our partnership, I’ve been able to evolve the HU concept, which was founded on the principles of unity, equality, humanity, and color by finding inspiration in everything I do. Giving different creators a global platform is an honor and continues to inspire me. Mitchell: You’ve been an active partner and collaborator with Adidas Originals — Describe how the relationship has evolved for you and what makes them the perfect brand to work with? Pusha T: Adidas Originals is perfect to work with simply because they really make your collaborations synonymous with you your brand, your character, and what your following knows you for. Adidas are trustworthy partners who respect what the creators have built on their own. Mitchell: As the leader of a global lifestyle brand — How would you describe the current convergence of music, marketing and technology? Torben: Music is the heartbeat of culture that unites audiences in an organic way. While partnerships have grown in recent years, we continue to have two-way conversations with talent. In this way, artists and brands are able to lean on each other in the pursuit of new creative outlets and opportunities. At the core of this are emerging technologies. New forms of digital communication are making the collaboration process easier and easier. It’s never been so simple for artists to work together and with brands. This facilitates such an amazing coming together of sounds and ideas from previously far to reach places. Mitchell: As an artists with an expansive career spanning nearly decades — How would you describe the current intersection of music, lifestyle and culture? Pusha T: The current intersection is at an all-time high. Hip-Hop started out being about not just the music, but fashion and lifestyle as well. In past years, we’ve just seen music lead the race. But now, with the power social media, all three factors are weighed the same and everything is seen collectively. That’s why it’s extremely important for artist to span across-genres and across-industries, instead of solely relying on the single craft they are well versed in. I believe that it shows the true worth of Hip-Hop culture when that happens. Mitchell: What role do you believe brands play in influencing and shaping contemporary culture? Pusha T: Brands are critically important, because their reach is so powerful and they can help amplify your voice. They are the conduit to widening your audience and reaching wider audiences worldwide. This speaks especially to brand partners who allow you to remain authentic and seek to be real partners, not just use the creative and take advantage of the cultural influence that they have. 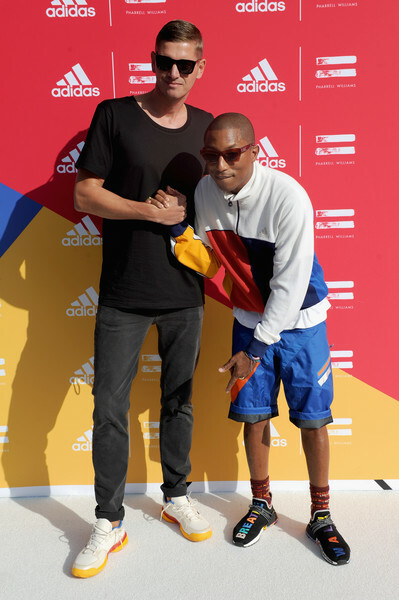 Mitchell: What makes collaborating with artists like Pharrell and Pusha T the perfect fit for Adidas and how do you approach these partnerships? Torben: It all goes back to shared values and mutual respect. We approach all of our creative collaborations in the same way, by allowing our creators to create freely and by learning from each other. In turn, the projects become very different. 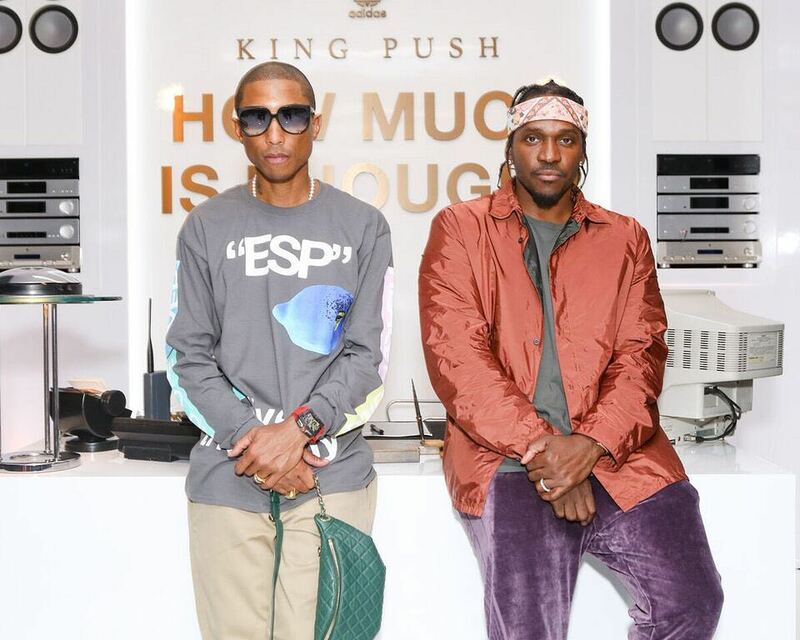 Both Pharrell and Pusha T are longstanding partners of the brand, and our work together continues to evolve which is a true testament to a successful partnership. Mitchell: What is the criteria you follow for establishing partnerships with artists or creators and what do you define as a winning collaboration? Torben: Our belief is to open ourselves up creatively to be inspired not only through internal collaboration, but also by looking outside of our brand at creators, artists and different types of partners. What brings us together is mutual respect and shared values. Involving others in the creative process provides moments for inspiration and collaboration between everyone involved. In the end, there is potential to be able to create something beyond what you could have done alone. Mitchell: How do you see emerging tech like AR and VR changing the way brands design, develop and market products? Torben: The way in which we go to market is heavily influenced by the emergence of new technologies and the increasing adoption of new social platforms by our consumer. Leveraging digital experiences allows us to keep up with the speed our consumer is moving at. We are currently exploring new technologies in different ways, from giving our consumer early access to unreleased product through AR, to how we enhanced the shopping experience at ComplexCon with a completely digital shopping platform.